Well it appears that summer is finally here in our beautiful Alberta Foothills. 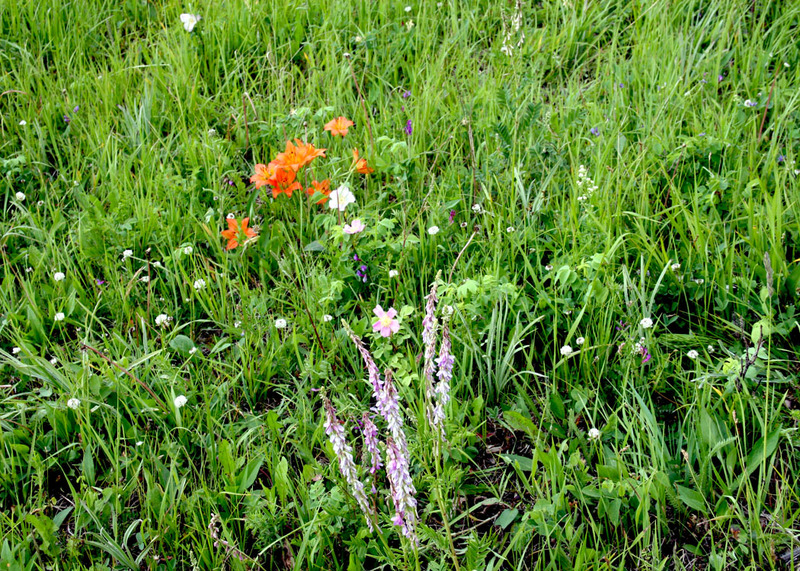 The grass is very lush and green and the wild flowers are showing their brilliant colors over the hillsides and meadows. The wild horses are enjoying the plentiful and thick forage grasses, which also enables them to extend their ranges this time of year. This spring’s foals are looking great and the mares, stallions and yearlings now have their proper weight back with no ribs now showing. Their coats are glossy, showing that they are in great shape. One of the things though that comes with the summer heat and sunshine, are the pesky insect pests. In my rides so far this year the bugs have not been a problem. This past weekend though we had to liberally apply repellant on our horses to keep those horrible horseflies away and keep the pesky mosquitos at bay. 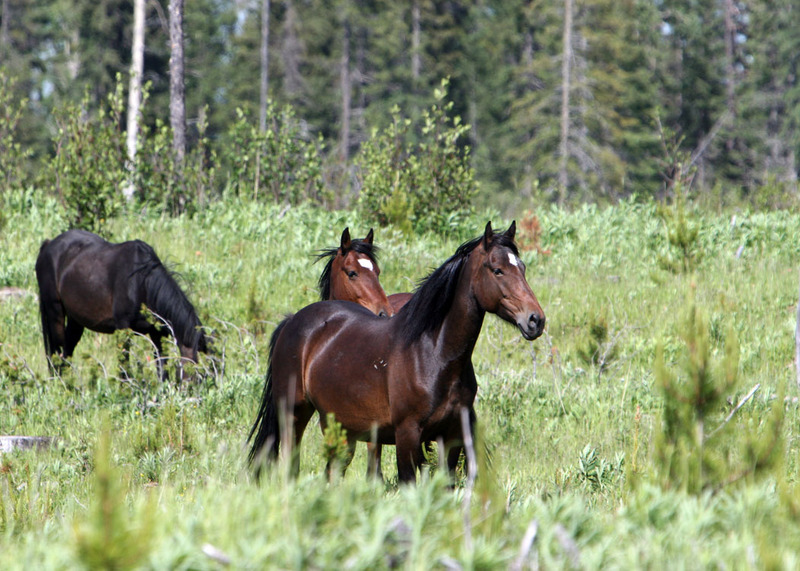 In my studies over the years the wild horses have several ways to help alleviate those bothersome pests. One is to do what we call tree up. Here they go into the thick timber and use the tress as tools to sweep the insects off of their bodies. 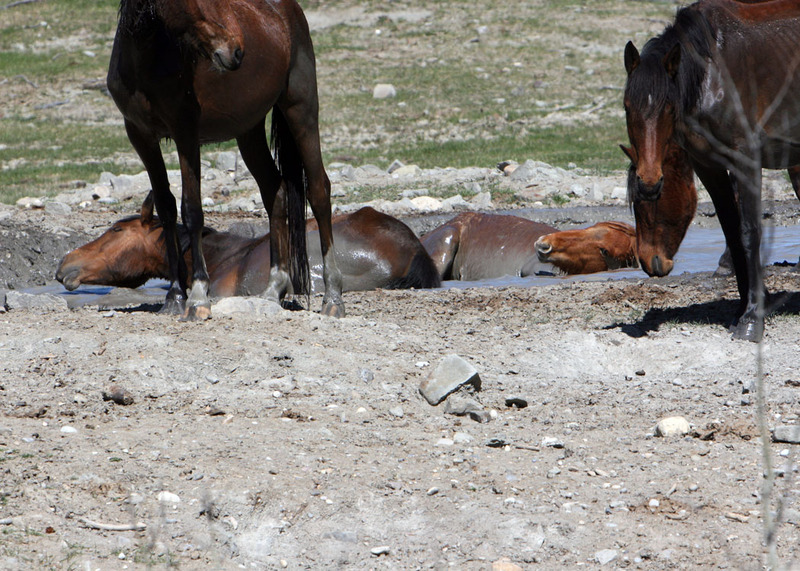 Another method are their mud baths. 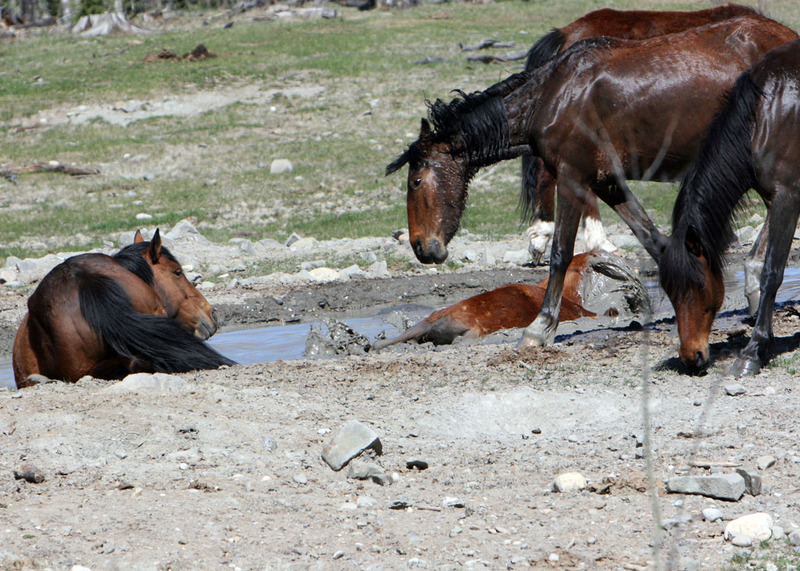 Throughout wild horse country there are little pot holes that are 1/2 water and 1/2 mud. 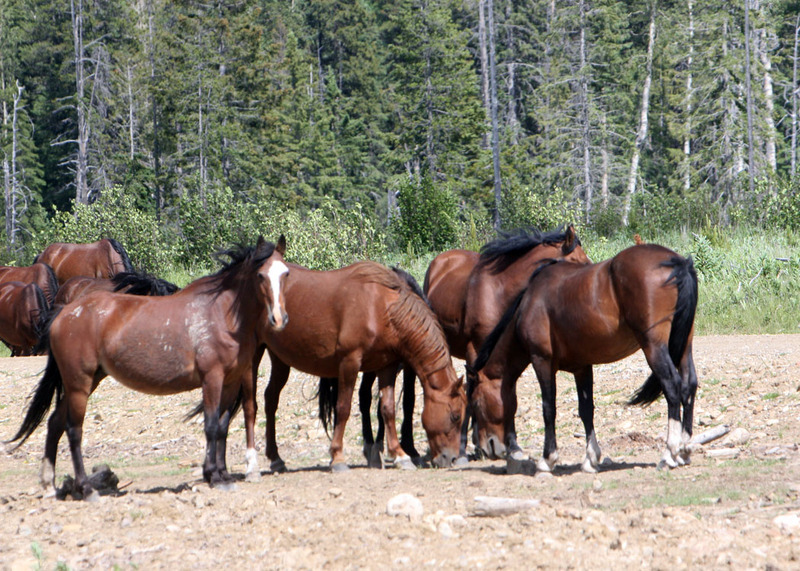 It is in these that the wild horses will roll and cover themselves with this mixture to keep the insects off. I also believe that it helps their skin in giving them natural nutrients and moisture. I caught this one herd at one of these mud pots and took great delight in watching them all take turns to roll and splash in it. 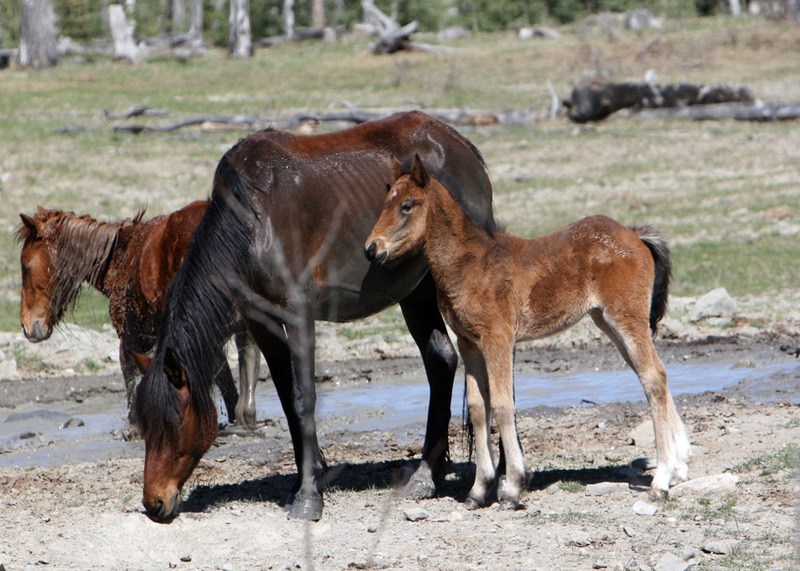 The one foal was so cute as it watched and kept walking around the mud hole watching it’s mom and the other members take their turns. The closest it got was when it put one hoof in the mixture, withdrew it quickly and shook it’s head as if to say, “no way”. 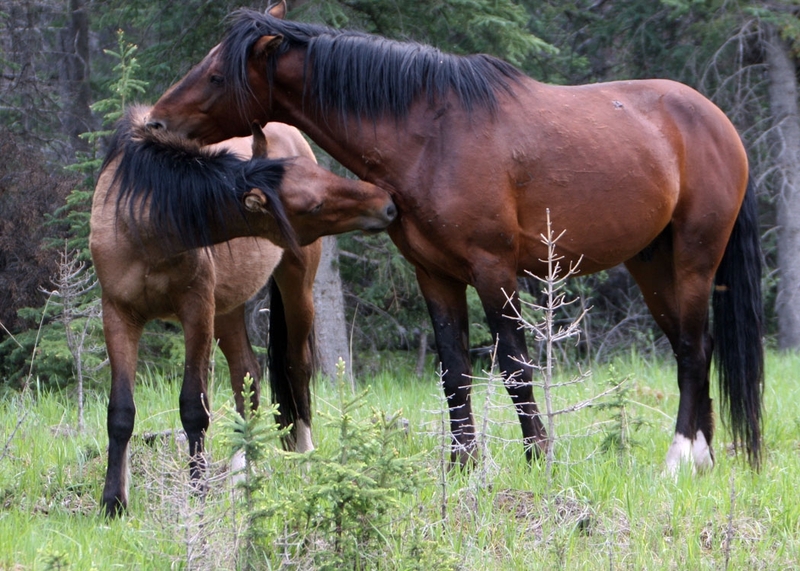 Another technique that the wild horses have found is that in certain locations there are mineral licks and some of these have something in them that when the horses ingest it they are not bothered as much by the insects. I would like to find out what this is and use it for my own horses. Then of course there is also the personal grooming that all horses use to relieve the itch of bites and scratches. The back country has not had as much rain as we have out here in the flat country and the trails are in good shape for this time of the year. The higher trails though you can still encounter some snow, so ride safe.